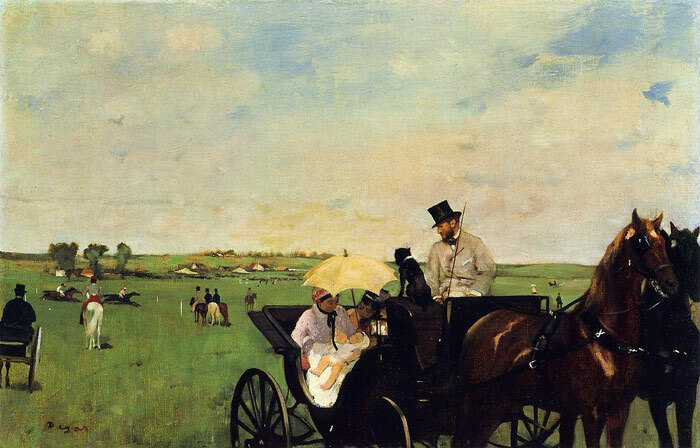 Degas's "Carriage at the Races" includes, against a larger view of a fashionable racecourse outside Paris, a small family portrait in the foreground carriage. We see Degas's friends, the Valpin?ons — the father in the driver's seat, the mother in the back with a parasol, the baby in the nursemaid's lap. A few years later, when the Commune threw Paris into chaos, Degas took up the Valpin?ons' invitation to stay in their country house until the disorder subsided. SPECIAL NOTE : The painter will make the reproduction as close to the original oil painting as possible. If you want your painting to alter from this likeness, please email us and " A Carriage at the Races, c.1872 " will be reproduced according to your special requirements.